Join the MarineQuest staff for a day exploring the marine habitats of coastal Wilmington and participate in lab experiments at the UNCW Center for Marine Science. 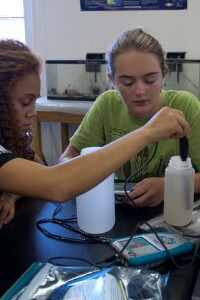 The day will begin with a tour of the Center for Marine Science where Girl Scouts will learn about the variety of careers involved in marine science (CE,1) and have a chance to view the Gulf Stream display and discuss how this underwater current influences our local weather (SB,3). 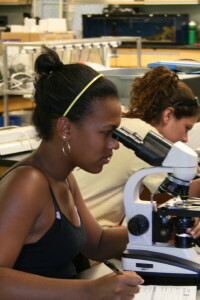 In the MarineQuest lab, Girls Scouts will become marine geologists as they examine sands from around North America (SB,2) and marine chemists as they discover how to get fresh water from sea water(T,4). During the afternoon this program heads out for a variety of field activities where Girls Scouts will explore the coastal forest (SB,1), sandy beaches (SB,1), and the salt marsh(SB,1). This is a full-day of fun, adventure and learning. This program will allow Girl Scouts to fulfill all the requirements for this Patch except for Service Project component which can be completed after the MarineQuest program. MarineQuest does not provide patches. A certificate of completed requirements will be provided. Girl Scouts should provide the completed certificate to a Scout Master who can then issue individual patches. To make a scout reservation or to reserve a program date, please complete the Program Reservation Form. After submitting your program form, please follow-up with an e-mail or by phone to verify that it has been received marinequest@uncw.edu or (910) 962-2640.